This week, my book tour brings me to the Northwest, with stops in both the USA and Canada. On Thursday, May 3rd I will be in Vancouver, BC at Le Marche St. George. Join me for a book signing and launch party at 6pm. Also attending will be a number of contributing artists from the book, including Patricia Larsen, Lelainia Lloyd, and Leslie Avon Miller. Those of you in the area can also attend Con Leche, an art exhibition including works by the Larsen family (Patricia, Janaki, Klee) and myself that will open the following week. On Saturday, May 5th I will at Bellevue Art & Frame in Bellevue, Washington, just outside of Seattle. Join me for an afternoon of art from 12-2pm. Contributing artists Donna Watson and Leslie Avon Miller will be participating with me in an artist panel and Q & A. All three of us will also be sharing our artwork and an art demo. This will be followed by a book signing with Donna and Leslie, as well as with Alicia Caudel, Robert Stockton, Lisa JonesMoore, and Delorse Lovelady -- all of whom will be in attendance and are contributors to the book. 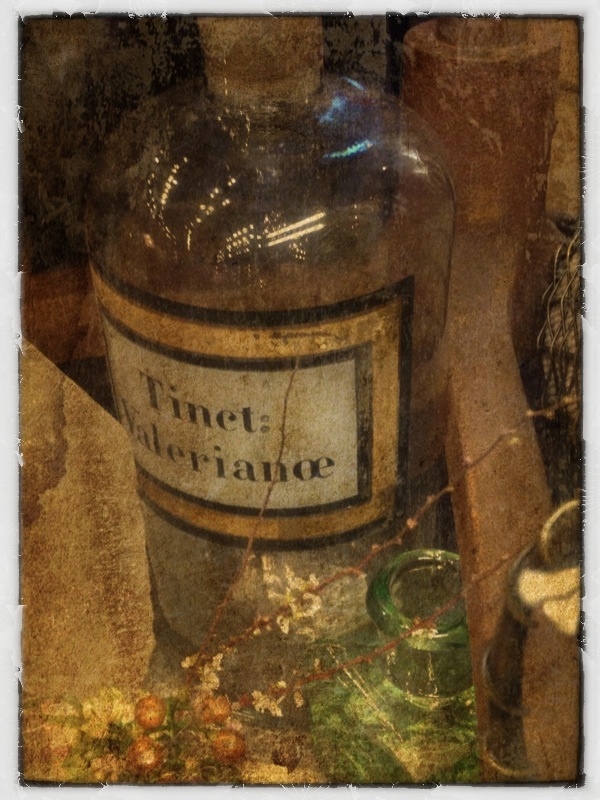 My contribution to David Hayes' monthly online App project. The brief: take a picture and build an image using in-device apps only. This image was created using four ingredients: original photo, Pic Grunger, Snapseed, and imagination. Head on over to Dave's site to find links to all the participants and info on how you can join this ongoing project. 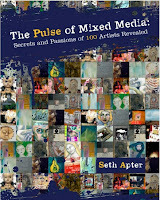 I will be heading west this week to continue promoting and celebrating the release of my book The Pulse of Mixed Media . 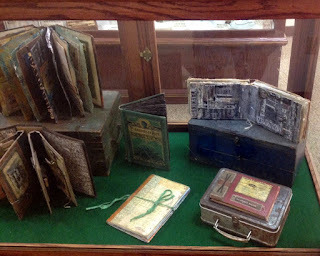 I have been enjoying my travels so much in part because I have been able to meet so many of the contributing artists and other blogging friends. Hoping that if YOU are in the areas I will be visiting, I can add YOU to the list of people I have actually met in real life. On Thursday, April 26th from 7 to 9pm, join me for a launch party, book signing, and live jazz at Momo Lomo in Fort Collins, CO. Also attending will be a number of contributing artists from Colorado, including Sarah Fishburn and Lisa Hoffman. On Saturday, April 28th, I will be in Boulder, CO at Two Hands Paperie. I will be moderating an artist panel with local contributing artists Lisa Hoffman, Sarah Fishburn, Fran Meneley and Marie Danti. The panel members will discuss their contributions to the book, answer audience questions, show samples of their artwork, share their personal creative process, and sign copies of the book. The panel is free and open to the public. The event runs from 10:30am to 12:00pm. Next week I will be heading to the Pacific Northwest and will be making stops in Bellevue, WA (right outside of Seattle) and Vancouver, BC in Canada. You can read more about these events here. Registration continues for Create...the mixed media retreat held in Somerset, New Jersey from July 18 to July 22. Create is sponsored by Interweave and Cloth Paper Scissors and this is the first time it is being held in NJ. I am celebrating the fact that the east coast now has another retreat to look forward too! You can find information about the workshops, instructors, registration, lodging, the Artists' Faire, special events, and more right here. I will be teaching 3 workshops and am hoping to see some of YOU there! 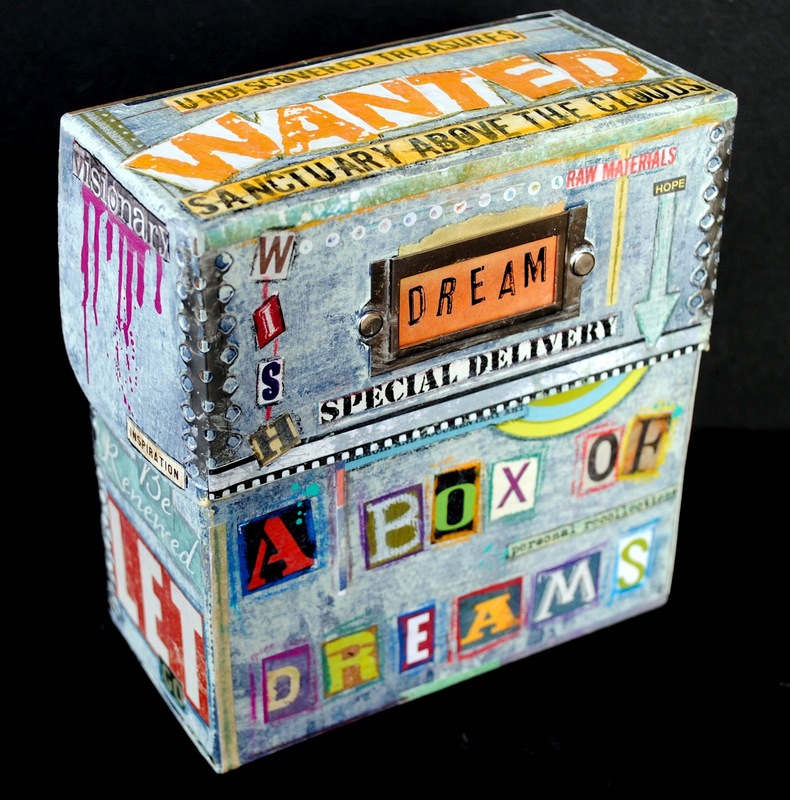 Create an artful and art-filled Box of Dreams to use as a place to create, document, and store your life goals, dreams, aspirations, and intentions. We will all start with the same blank box and set of blank cards and spend the day personalizing and customizing the materials to reflect you. This workshop will introduce a series of mixed media, painting, and collage techniques that can be used for any future project. In this workshop you will create a personal dossier - a handmade, mixed media journal that you can use long after the workshop ends. Use it as a daily journal, a travel journal, a family scrapbook, or a theme-based diary for your interests, hobbies, or collections. During the workshop you will learn a variety of mixed-media techniques for creating layers, texture, and dimension. A simple approach to binding will allow you to pull the entire project together and to add pages to your dossier at any point in the future. This is a twist on a class that I recently taught at The Ink Pad. I was excited that each and every student created a highly unique and personal dossier and that no two projects looked alike. Here is just one example. Learn to work small with a big impact. 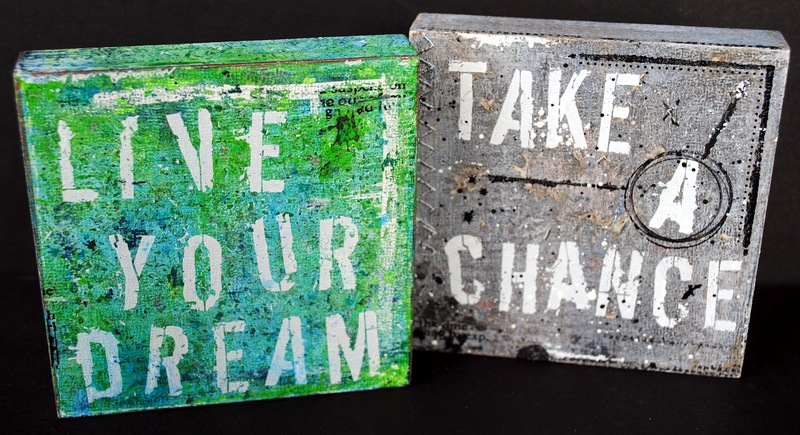 In this workshop we will create mixed media paintings on a small scale using 4 x4 and 6x6 cradled wood panels. Even though this class is project-based, the emphasis will be on technique. You will learn a series of approaches to make layered and textured surfaces, which can be applied to an endless number of projects. 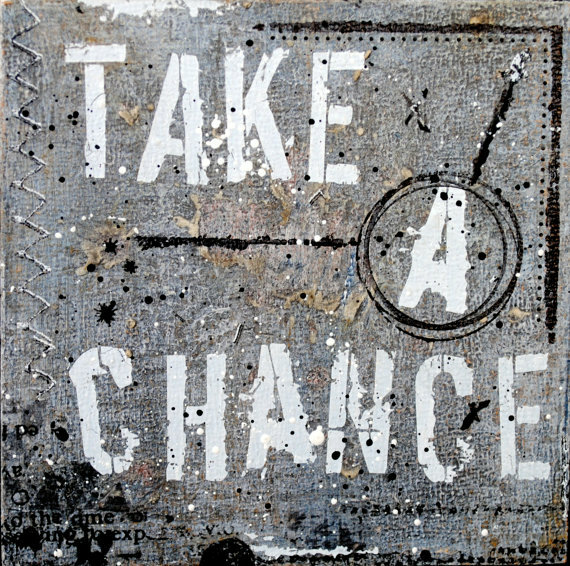 We will be using text as the main foreground component of each painting, so you will be expressing yourself both in words and visual design. 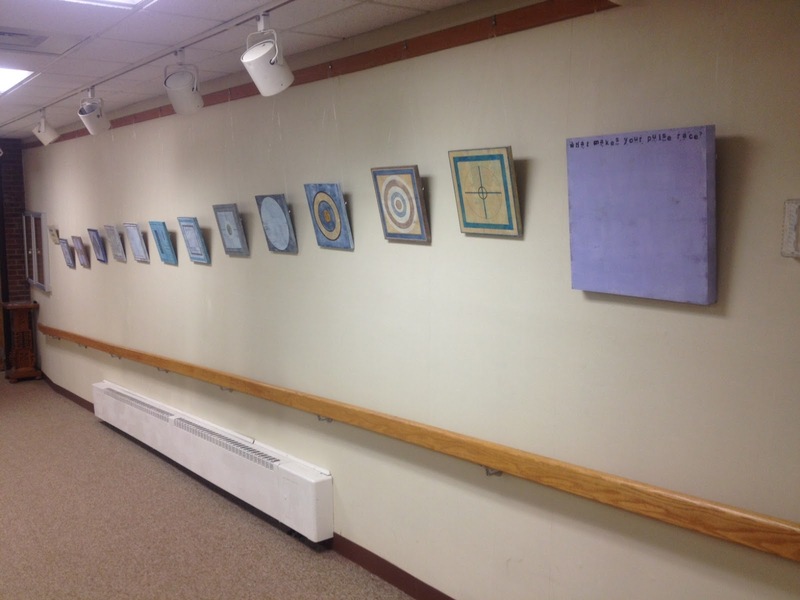 Earlier this month I highlighted the paintings from my Interior Angles series that is part of my current exhibition at The Gallery Link in Ellenville, NY. 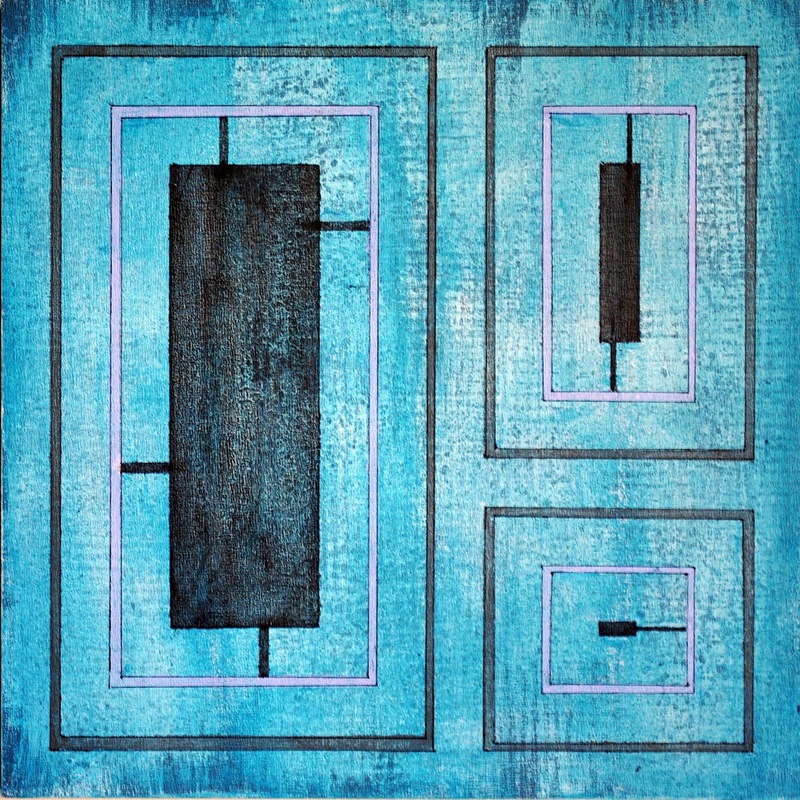 Interior Angles consists of 12 abstract, acrylic paintings. This exhibition also includes nine mixed media works that make up the series Passages. These pieces are meditations on changes and the passing of time. 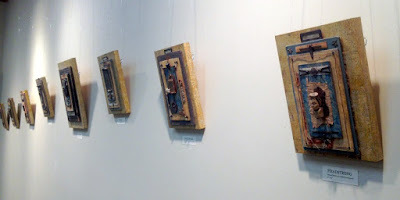 The origin of this series began with Headstrong, which appears in Pam Carriker's book Art at the Speed of Life . And reflecting the concept of change inherent in this series, this piece has been changed since it was first published in Pam's book. 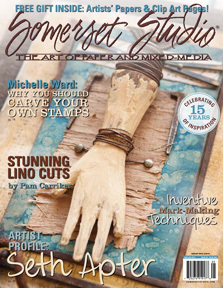 Angel Hand is currently featured on the cover of the May/June 2012 issue of Somerset Studio. And Charlotte is featured on the pages of Somerset Studio as well. The remaining three pieces from this series are "spoken for" and you will be seeing them in various places in the coming months. 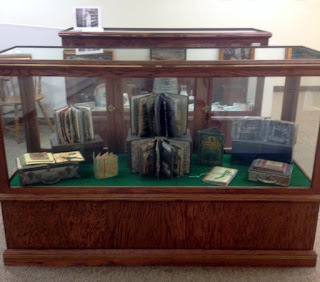 Also on view at my exhibition in Ellenville are a number of my handmade books - some that I have made on my own and some that are part of collaborations. I love being able to see all of these books on display together. The exhibition runs through April 23rd, so this is the last weekend to visit if you are in the Hudson Valley in New York. 2012 continues to be a magical year for me. And it has barely just begun to unfold. I am overflowing with gratitude and savoring each and every moment of my adventure in art. I just received the May/June 2012 issue of Somerset Studio, in which I am the subject of the Artist Profile. I was interviewed for this feature by my friend Rice Freeman-Zachery, which was a pleasure on its own. Also included are a number of images of my artwork from the last few years. The photography in Somerset Studio is second to none and the level of detail that they captured in my work is astonishing. Although I knew that the profile would be published in this issue, I did not know until very recently that my artwork would be on the cover. 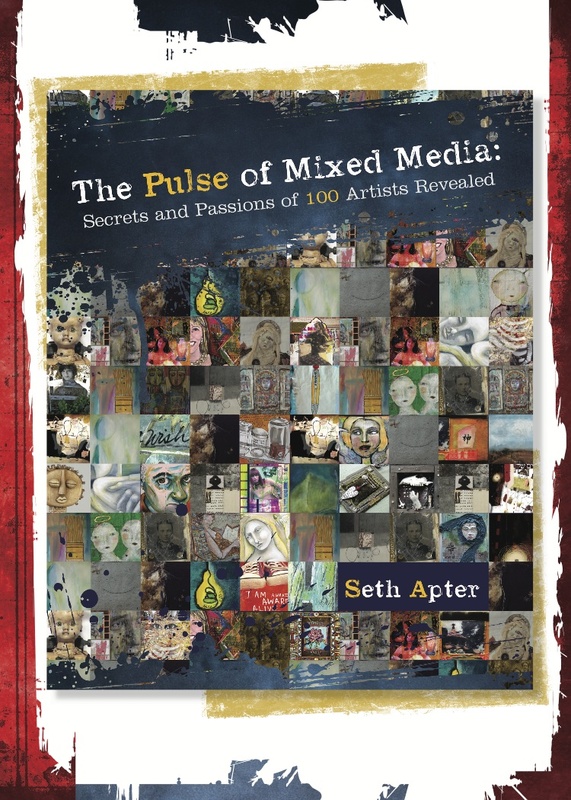 And I did not know until the moment I read through the issue that a review of my book The Pulse of Mixed Media is also included. Let's just say I am Grateful with a Capital G.
Somerset Studio was among the first introductions I had to mixed media art and has played a tremendous role in my development as an artist. I remember reading this magazine long before I started my blog and being mesmerized by the art and artists on the covers and on the pages. I currently have an exhibition of new work at The Gallery Link, which is part of the Ellenville Public Library and Museum in the Hudson Valley in New York. 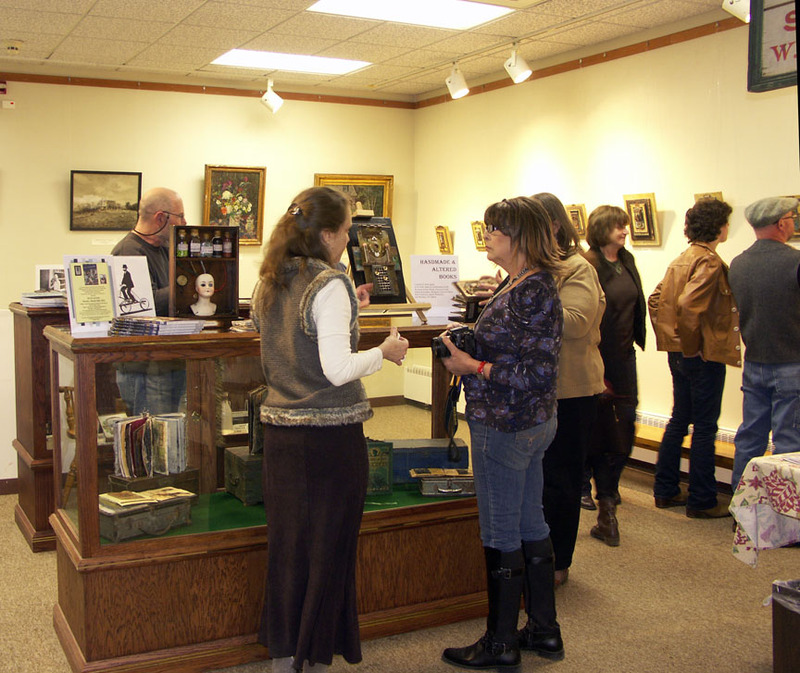 The exhibition opened on March 1 and runs through April 23. There was an official opening on March 26 along with an artist talk to celebrate the release of The Pulse of Mixed Media. The exhibition consists of two series of paintings: Interior Angles and Passages, the latter of which will be featured in a future post. The 12 pieces from Interior Angles represents a different direction for me. 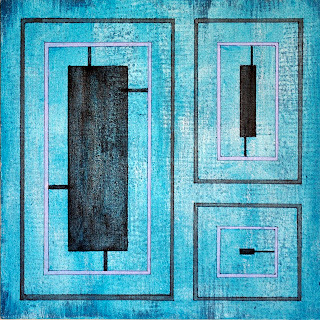 They are all created on 12" x 12" wood cradled panels and are abstract acrylics. No mixed media to be found, although by clicking on and enlarging these images, you might be able to get an idea of the layers and texture that make up these pieces. This series is very personal. It represents contrasts. The background and underpainting, much of which cannot be seen, are spontaneous, random, and free - almost chaotic. The surface is structured, bounded, and restricted. Welcome to my blog hop. Everyday from April 2nd through April 12th I will link to a different blog as part of my celebration of the release of my book The Pulse of Mixed Media: Secrets and Passions of 100 Artists Revealed . There will be book reviews, personal thoughts, and giveaways. And every blogger along the way will become part of the book, as they will also post their own responses to their choice of survey questions from the book. 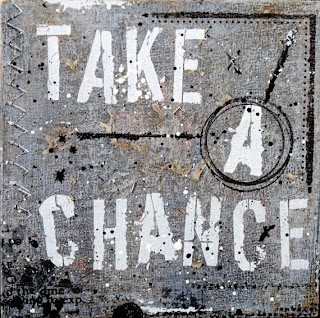 You too can be part of The Pulse by responding to my open call for art! And on each day of the blog hop, I will also be sharing something extra. And today is an extra you will not want to pass by! For the 11th and final day of this blog hop, we visit Stephanie Hilvitz. 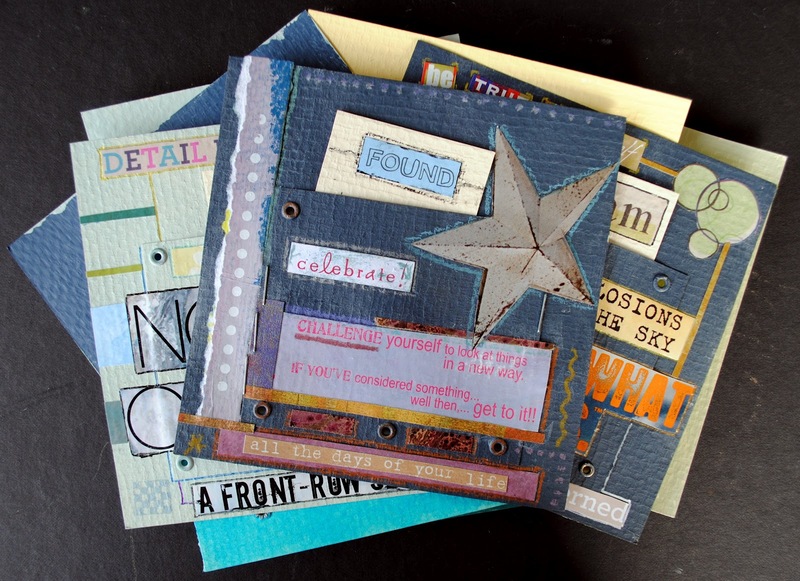 A trip to Steph's blog, Mango Studio, is like an explosion of color and creativity. And I am happy to say that I will be meeting Steph in person later this month when my book tour takes me to Colorado. I know that she will be every bit as colorful in person as her blog and beautiful art. Steph has been a contributor to my online version of The Pulse and we are frequent visitors to each other's blogs. Make sure you get off at the last stop on this tour and see what Steph has to say about The Pulse of Mixed Media. After you visit Steph, head on over to Seek Your Course. If you are not already familiar with this site, you are in for a special treat. Seek Your Course is overflowing with information about art workshops and instructors. But there is so much more to find there too. And today on their blog, you can read an interview that Jess, the amazing visionary behind the site, conducted with me. 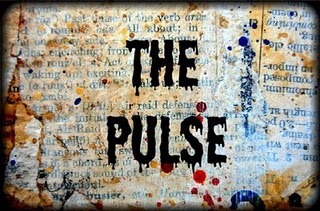 There is a review of The Pulse of Mixed Media as well. Head on over to the colorful and dynamic world of Dina Wakley. I love her freewheeling approach to art and am so pleased that she has been part of several of the online versions of The Pulse. 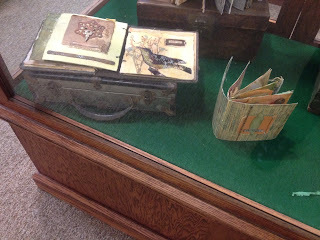 She has a unique and distinct style that she uses to create dramatic journals and artwork. 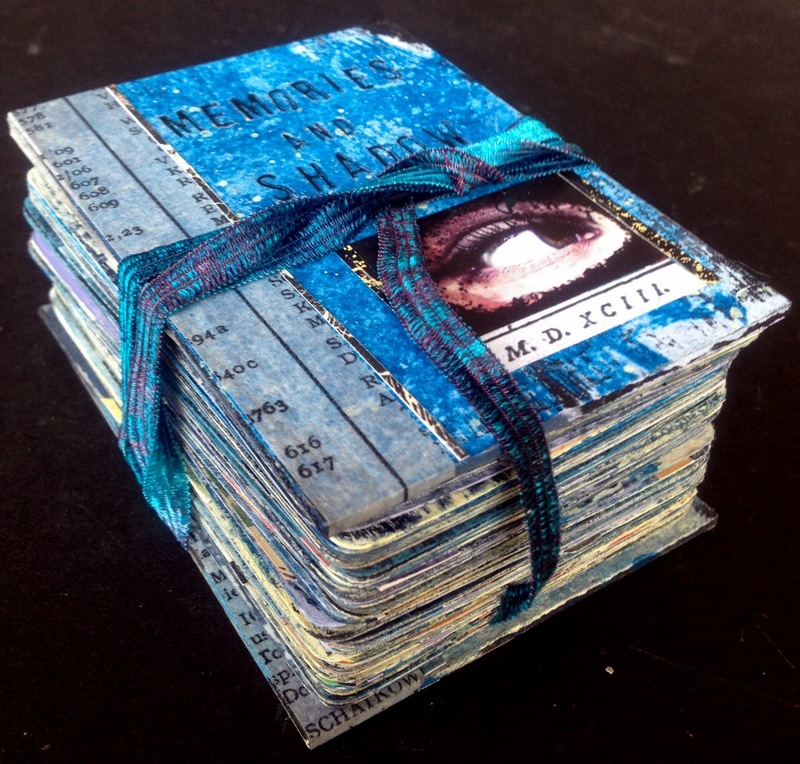 She has her own line of cling mount stamps, teaches workshops internationally, and lives at the intersection of Artist and Scrapper. She will be teaching in NYC later this year and I look forward to meeting her in person. Today on her blog, she talks all things The Pulse of Mixed Media. I am excited to be in The Metro DC area tonight for an artist talk and book signing at the Judith HeartSong Fine Art Studio and Gallery in Glen Echo, Maryland. The event runs from 6-8pm. Seating is limited and you can RSVP by emailing me at shap97@gmail.com. I will be speaking to a dynamic group of "regulars" who are part of a monthly Art Salon, as well as additional attendees -- many of whom are familiar to me from blogland. Happy also that contributing artist Lisa Jurist will also be attending. Look for s review of the event, pictures and all, on my blog in the coming days. 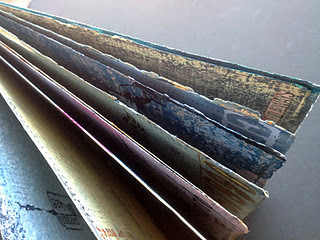 Today we visit Melody Nunez on the blog hop. 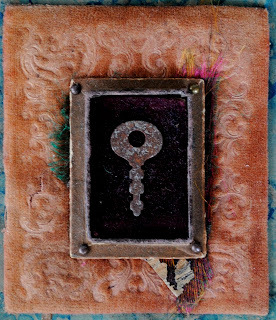 Melody is an artist, photographer and writer who creates wonderful journals, collages and mixed media pieces. Even if you don't think that you are familiar with Melody and her artwork, you probably are. Her words and work have been seen in many Stampington publications since 2003. And she is a member of the design team at Crescendoh.com. As you dig deep into her blog, you will see that Melody is one generous person as well: whether it is sharing a tutorial or volunteer teaching journaling to disadvantaged school children. Today her generosity is evident as host of a giveaway for a copy of The Pulse of Mixed Media. Head on over here to read all about it! Still not sure if you want to submit artwork for my open call? Read about the details here. The deadline for mailing is 4/31, so there is still plenty of time. This call is open to everybody, regardless of level of experience. Every submission will be posted on my blog.